Step out the front door, cross the road and you are at the market place where there is an artisan market each Monday. 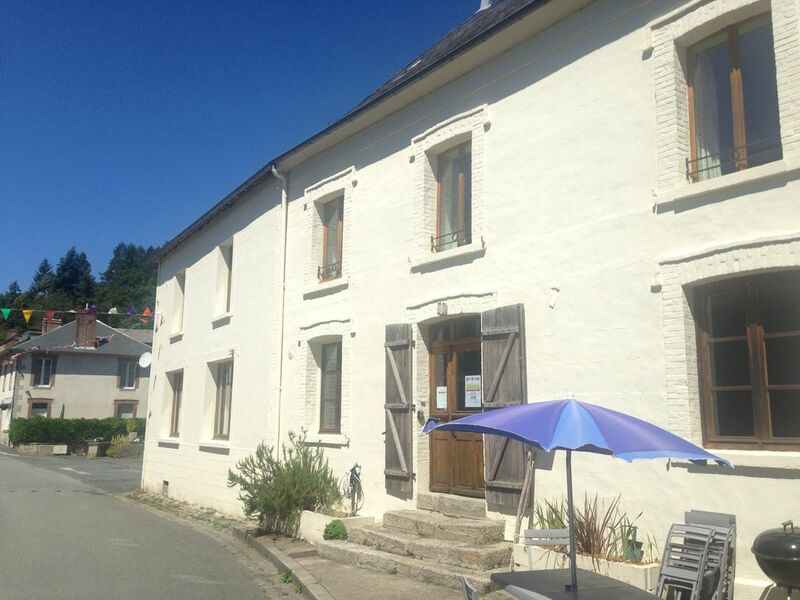 Further along the road you come to the Auberge which includes a small shop from which you can buy your daily provisions, baguettes, croissant etc. While there, stop for a coffee, glass of wine or light snack and a chat. Five minutes in any direction and you are in a walkers paradise, whether it be following one of the many designated routes through the woodland, travelling the path that leads you down to the river, passing the six fountains as you go. Or whether you would rather walk the short distance to the lake where you can relax on the manmade beach, take a swim, hire a pedalo, eat an ice cream and enjoy a drink. Whichever route you choose you can enjoy the tranquillity of this little known idyll. Along your way you may encounter the occasional pilgrim who is following the 900 year old pilgrimage route to Santiago De Compestella. Look out for the sign of the shell around the region and you will know that you are following this well-trodden path. Cyclist can enjoy part of the route taken by the Tour de Limousin which takes you through many kilometres of extremely quiet and gently inclined roads through the Ambazac Mountains. Just be aware that a deer may wish to share your path. There are number of eateries within a 5 minute drive. The nearest of which is less than 2 kilometres away and offers homemade food and often has live music. Look out for posters in the market place at Chatelus that advertise local events. Ambazac and Bourganeuf are local towns (15-20 minute drive) which have super markets and petrol stations as well as a range of small shops. The main city in the region is Limoges with its wealth of attractions not least of all, its magnificent cathedral. There are a various museums and galleries an opera house and good shopping. There is a fabulous walk along the river which you can break up by stopping for lunch at one of the cafes. Lac Pardoux 35 minutes away which as well as having the usual attractions also has a tree walk which ends on a zip slide across the lake. Lac Vissiviere, a 50 minute drive is very popular for its range of boating facilities. A family favourite is Lac Erguzon with its inflatable rides, swimming, playground and café. The region is steeped in history from Henry II to Richard the Lionheart. Many of the local churches date from the 11th and 12th centuries. This is an ideal place for anyone looking for the peace and space to relax and look at the world. We fell in love with the house having stayed in the house over a number of years. It felt like home from home. Whenever we return to Chatelus le Marchiex we feel a great sense of peace. The surrounding countryside is a haven for wildlife, and you can walk for miles through forests, besides lakes and rivers. Yet the village regularly bustles whether during the weekly market or during one of the summer festivals. The firework displays above the lake are simply spectacular. The salon is large and has a number of seating areas, bookshelves to peruse, TV and dvd player, with a range of dvds to enjoy. All furnishings are vintage.